Diphtheria is an acute infectious disease characterized by phenomena of intoxication and education fibrinous films or raids on the mucous membranes of the mouth, nose, throat and skin. the cause diphtheria diphtheria is coli (Fig. 1). 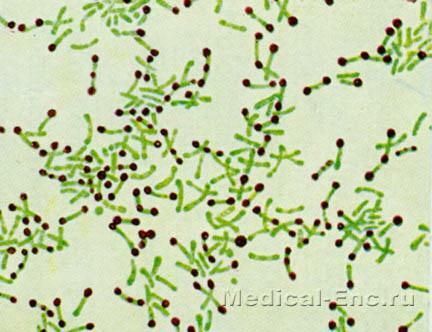 Very close to the diphtheria Bacillus, according to morphological characteristics pseudodifferential bacilli, sticks Hofmann, conditionally grouped into the group, diphtheroids. Diphtheroids distributed on the surface of the body, on the mucous membranes of the nose, respiratory tract, eyes. Most microorganisms belonging to the group of diphtheroids, non-pathogenic for humans. The source of infection is a sick diphtheria or healthy bacteriological. The infection is transmitted by airborne droplets. Due to the resistance of the pathogen infection can occur through various items. The patient becomes contagious already in the last days of the incubation period and continues to be during the whole period of illness, and sometimes longer. The increase in the number of cases of diphtheria is observed in autumn-winter period. In place of falling of diphtheria bacilli occurs hearth fibrinous inflammation, where the intake of allocated coli toxin. In the process involved nearby lymph nodes, which are increasing in size. There is swelling environmental subcutaneous tissue. The most susceptible children aged from 1 to 7 years. The children of the first months of life have a passive antitoxic immunity, which is transmitted through the placenta and is supported in part by breast feeding. Susceptibility to diphtheria can be identified by the reaction of Chic (intradermal injection of specially prepared divorced diphtheria toxin in the amount of 0.1 ml containing 1/40 dose lethal for Guinea pigs). The appearance of redness and infiltration of the skin with a diameter of at least 1 cm (positive reaction) indicates susceptibility. After suffering diphtheria specific immunity is acquired, however, its resistance is less, than at other childhood infections. The incubation period is 2 to 10 days. Depending on the entrance gate of the infection is a great variety of clinical forms of the disease. 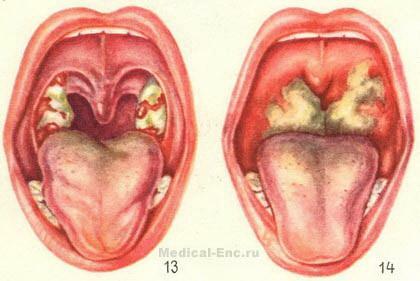 The most common form is diphtheria pharynx, which is localized (Fig. 13), common and toxic (Fig. 14). The localized form is characterized by a small increase in body temperature, few expressed intoxication. Tonsils enlarged, often giperemiei. Pain when swallowing small or absent. By the end of the first or on the second day is formed typical dirty gray filmy plaque. The film is removed with difficulty, in its place, the mucous membrane bleeds. When common form of diphtheria intoxication more pronounced temperature above raids more dense. Not only do they line the surface of the tonsils, but also pass on the mucous membrane of the Palatine arches, tongue and throat. Early manifestations of toxic form of diphtheria are high fever (up to 40 degrees), headache, chills, vomiting, abdominal pain, not entirely clear spider or jelly small raids. In the next day strikes quickly spread and compacted, there is swelling of the mucous membrane of the throat and subcutaneous fat neck. Intoxication of I degree of swelling applies to the first neck folds, II degree - to the collarbone, III degree - below the clavicle. Characteristic of sweet sweet breath, and he drew his, sometimes snoring breath. The speech with a nasal tone. Growing and other manifestations of intoxication - damage to the heart, kidney, paralysis.